In technology right now we are starting to make our plans for the flashlights that we are making. The only two rules about the flashlight is that it has to be waterproof and it has to fit in a box of a certain size. To make the flashlight we are using plumbing pipes which are pretty strong. We haven’t actually started to make the flashlight yet, but the planning is pretty interesting. I can’t wait to start making the flashlight and see how it turns out. I will be posting again soon about the flashlights and how they work. Hope everyone had a great Break and HAPPY NEW YEAR!!! Hope that everyone is having a great break. I briefly talked about my switches in my post about breadboards, but lets get more into it. I made three different switches that all work in different ways. All of the switches can be both turned one and turned off. My first one you have to push and pull horizontally to get the switch to work. My second one you have to twist to get the switch to work. My third one you have to push and pull vertically to get the switch to work. We got to make the switches with any different materials, but here is how they work. There needs to be tinfoil on at least two parts of each switch. When you push, pull, spin, throw, twist, or however your switch works these two pieces of tinfoil need to touch. When this happens the electricity runs through the switch which can allow it to complete a circuit and light something up. The switches took about two weeks to make and it was a lot of fun. Hope everyone has a good rest of the break. Bye. In technology recently we used breadboards to connects to our switches. The breadboard has many different holes. We put jumper cables into certain holes that were aligned on the breadboard with the LED’s we put 0n the breadboard. We then connected alligator clips on one side into the breadboard and the other side was connected to our switch. When the switch was properly switched on the LED’s lite up and it was really cool. It was hard to create and took a little while to make, but it was still fun. If you don’t put the effort in you won’t end up with a good result. I’ll be posting again soon. Bye. Hey guys, what up. In tech lately we have been doing some really cool things. One of the things that we did was make solder people. We used metal to shape mini people that are doing different things. My solder person was playing baseball, and it was really fun to make. We used a soldering iron to basically glue the different parts of the mini person together. The soldering iron has a really hot tip and when you touch it to a small piece of metal it melts it making metal glue. The glue dries really quickly. My person Look really cool and it can also stand which is pretty cool. I can’t wait to tell you guys about the other project we are creating, bye. In technology class we recently learned about voltage and how batteries work. So there is a positive and a negative side to every battery. There are electrons that are trying to get to the positive side of the battery. They go out of the negative side, go through the whole circuit, and then go back into the battery, but this time on the positive side. If there is no resistance, the lightbulb, then the electrons will overheat the circuit and then cause a fire which is not good unless you like starting fires. That is all that I have to tell you. I will be posting soon about more cool things. Bye! In technology today we made circuts. 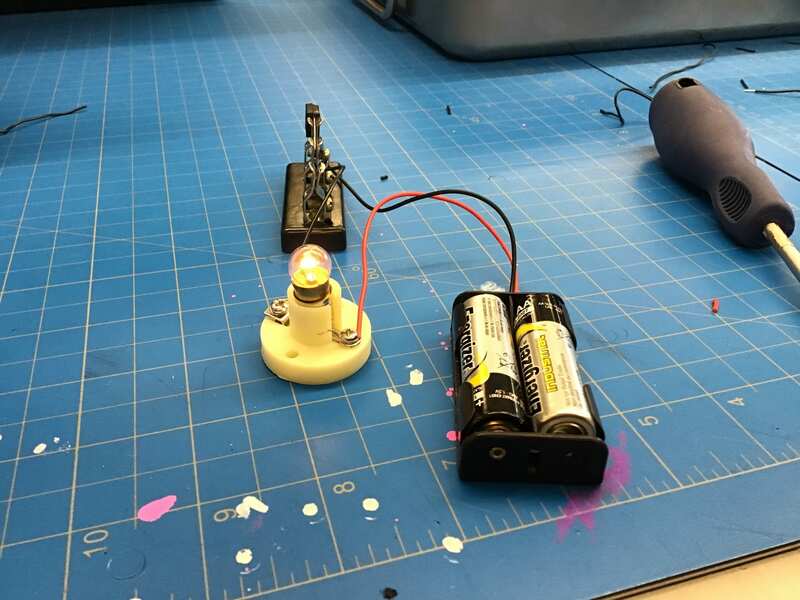 We had to connect a battery to wires, that connected to a switch, which connected to more wires, which connected to a light bulb, which connected to more wires that connected back to the battery. This is a picture of the circuit. The circuit was a lot of fun to make and it took me about fifteen minutes to create. I hope that I will get to create similar and more complicated circuits in classes to come with possibly more lights and other things too. I will be posting again soon. Bye. In technology right now we are learning about atoms. Atoms are what make up our world and they are pretty complicated. An atom is made up of Neutrons, Protons, and Electrons. In the center of atom, there is a nucleus. The nucleus is made up of Protons and Neutrons. Neutrons have a neutral charge and the Protons have a positive charge. The neutrons keep the Protons away from each other because they can’t touch. Surrounding the nucleus are Electrons that orbit around the nucleus. The Electrons have a negative charge. Depending on how many Protons and electrons there are you can tell if the atom is positively charged or negatively charged. That’s all for now. I’ll be posting again soon, bye! Today in Tech class we did a breakout EDU. This is a game where you have to find clues to open locks that are scattered around the room. You have a certain amount of time and you have two hints if you need them. Our class was split up into two teams which each had our own clues. We had three locks, a direction lock, a word lock, and a number lock. There was also an addition bonus lock, but only one for the two teams and this was also a number lock. My team finished in about twenty minutes and it was really fun. I hop that I get to do one again soon. I just started the Technology quarterly, and we learned about safety when using all the different tools. Some of the different tools include drill presses and soldering irons. There are twelve rules that you should always follow when working with these tools. 1. Slow down, think before you act 2. Dress responsibly. Tie back long hair. No baggy clothing and dangling jewelry 3. Don’t assume you know training before tools. 4. Power tools need concentration. NO talking when using machinery. 5. Protect your eyes. Always safety glasses wear. 6. Before using a machine get instruction, get permission, inspect machine. 7. Use all guards when using machines. Shut off and before making adjustments, unplug. 8. Power tools are dangerous. Never leave a tool running unattended. 9. Soldering irons are hot. Be cautious. Soldering irons heat to over 842 degrees fahrenheit. 10. Xacto knives, saws, and awis, oh my. Be careful when handling sharp things. 11. Walk all the time. Never nudge or push someone. 12. Report all accidents. Burns, cuts, scratches, and splinters, no matter how small. Those are the twelve safety rules for technology, and if you can follow those you should be good to go. That’s all I have to tell you, Bye.